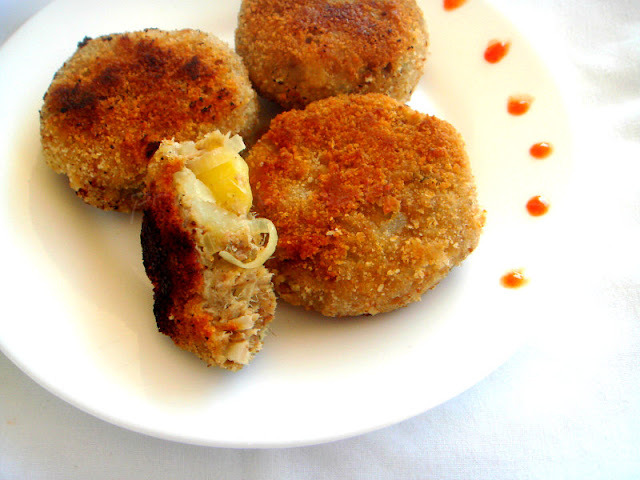 Fish cutlet are always our family favourite, recently i prepared a quick and easy breezy cutlet with both canned tuna fish and rolled oats as i dont have enough potatoes, i halved potatoes with rolled oats and final result was a delicious,healthy cutlets. They goes awesome as side dish for a rice dish or as a starter for a party menu also at the same time for evening snacks. Serve it with ketchup or sweet chilly sauce,just watch out how fast these cutlets will disappear.Sending this delicious cutlets to Usha's Seafood Feast. Saute the chopped onions and chopped green chillies with enough oil until the onions turns transculent. Meanwhile drain the water from the canned fish and squeeze out the water completely, meanwhile mash the cooked potato, rolled oats together. Now add the tuna fish to the prepared potato-oats mixture, now add the sauteed onions,garam masala powder,cumin powder,salt and mix everything well. Make out medium sized balls and flatten them as medium patties. Prepare a batter with corn flour with enough water, drop the prepared patties one by one to the prepared batter and roll them evenly over the breadcrumbs. Keep aside and finish with the remaining patties. Heat enough oil in a pan, fry the prepared cutlets in small batches until the crust turns golden brown, drain the excess of oil with a paper towel. That's a really unusual combo! Nice idea Priya..quick fix ! cutlets look so tasty !! yummy and lovely cutlets...looks tempting and delicious. Priya..your recipes are really versatile and totally yummy!!! i love this combo.. I like the idea of adding oats in tuma cutlet, looks delicious! very interesting combo and healthy dish....looks delicious.. Love the clicks.. Delicious and healthy cutlet Looks perfect Priya. Healthy combo and sounds so yum! Using oats is a nice idea and healthy as well. Thanks for linking it to my seafood event.